The community of Extremadura is one of the lands of the bull par excellence, there is a large number of ranches dedicated to the breeding of the fighting bull and some of the most important cattle fairs in Spain are celebrated here. Peraleda de la Mata, in the province of Cáceres, celebrates its patron saint festivities in mid-September in honor of the Most Holy Christ of Humility. 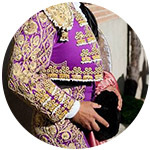 With an important role of the neighbours, there is no shortage of festivals and bullfights. It takes place in mid-September on the occasion of its patron saint festivities. A bullfight is celebrated. How to get from Cáceres to Peraleda de la Mata: Peraleda is located 121 km from Cáceres (1h 15 minutes by car). How to get here | Driving Direction. Address Peraleda de la Mata Bullring: portable bullring. 10335 - Peraleda de la Mata, Cáceres. Bulls from Peralta starred in the 2018 poster, where made the 'paseíllo' the horse-bullfighters Sergio Galán, Leonardo Hernández and Ana Rita, leaving the last two on shoulders. 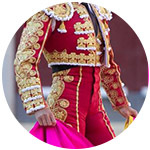 We regret to inform you that, currently, Servitoro does not have tickets for this show, but we recommend other bullfighting experiences a few kilometers from Peraleda de la Mata. Servitoro, bullfighting news of Peraleda de la Mata bullring, Cáceres.